Merry Christmas to all my friends and readers.. A celebration brings family and friends together. Always the festive seasons are special to celebrate faith, family and the tradition of sharing gifts and sweets. It helps us appreciate the love in our lives, we often take for granted. 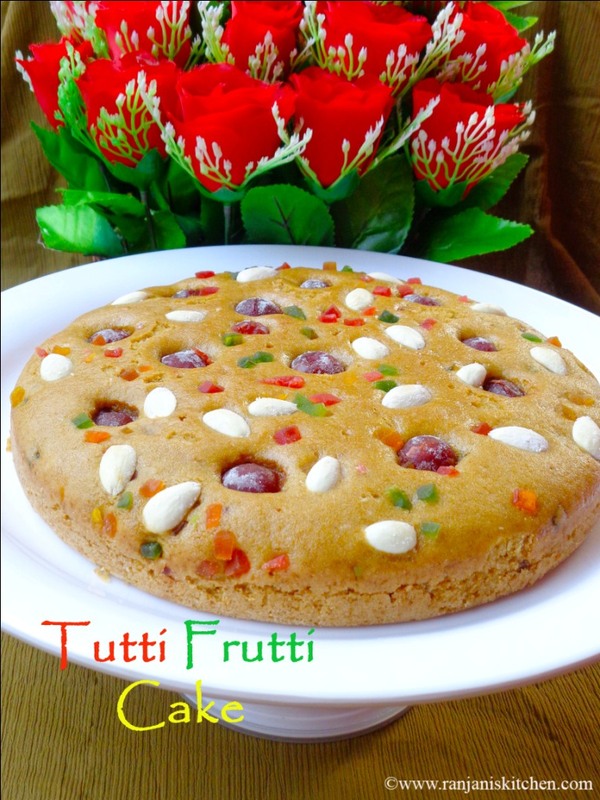 Vegan Tutti frutti cake | wheat tutti frutti cake – I made this cake to share with my friends. 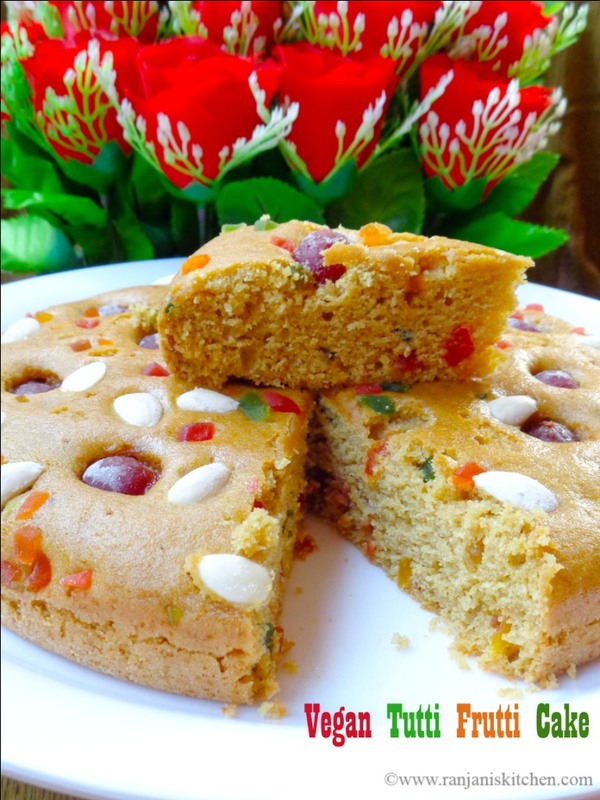 So its a diary free and egg free cake with wheat as per some request from friends. I did some improvisations from the original recipe as I wanted to post this for Christmas.So it must be colorful and appealing right. Yes, that’s why I topped with some nuts and cherries. My friends and neighbors enjoyed this healthy cake and gave me a good feedback.Always It’s a great feeling to get positive air for our work. Friends lets celebrate this auspicious day with your family, friends and loved ones. Have yourself a very merry Christmas. May you all reap the fruits of your hard work in life. Soak almonds in water for 6 hrs, peel off the skin and halve into two. 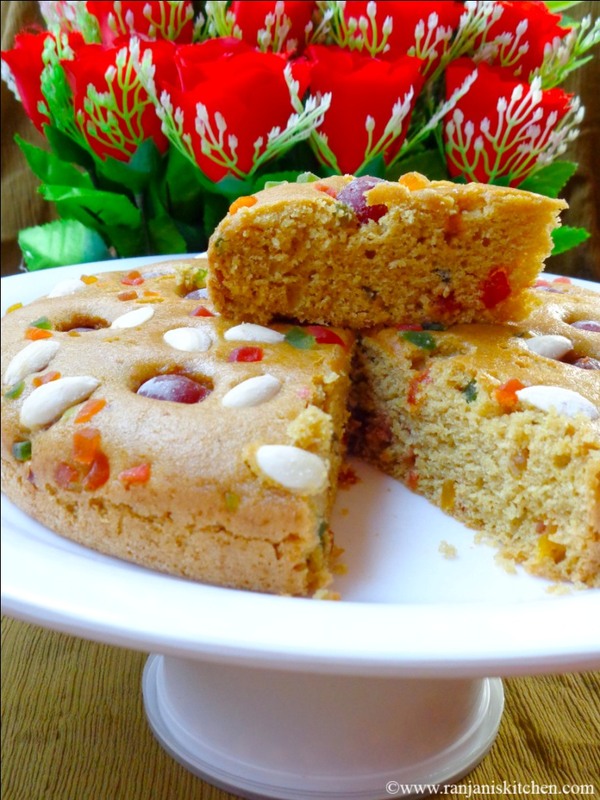 Mix tutti frutti, almonds and cherries in flour, mix well and keep aside. Preheat oven to 180 degrees. Grease the pan with oil and dust with flour or use parchment/butter paper after applying oil on the pan. Set the pan ready and keep aside. In a bowl, sieve wheat flour, baking powder, baking soda and salt together. Give a mix with spoon to mix all the ingredients together and set aside. In a mixing bowl, add sugar, water, oil, lemon juice, and vanilla essence. Using whisk,mix it well till the sugar completely dissolves.Also water and oil must incorporate well. That is, the oil should not stand over in the water. Now add the sieved flour to the wet ingredients in two sections.. Fold the mixture using spatula or whisk, slowly until no lumps in the batter. Do not over mix the batter.Now add ¼ cup of tutti frutti to the batter. Gently mix and pour the batter into greased pan. 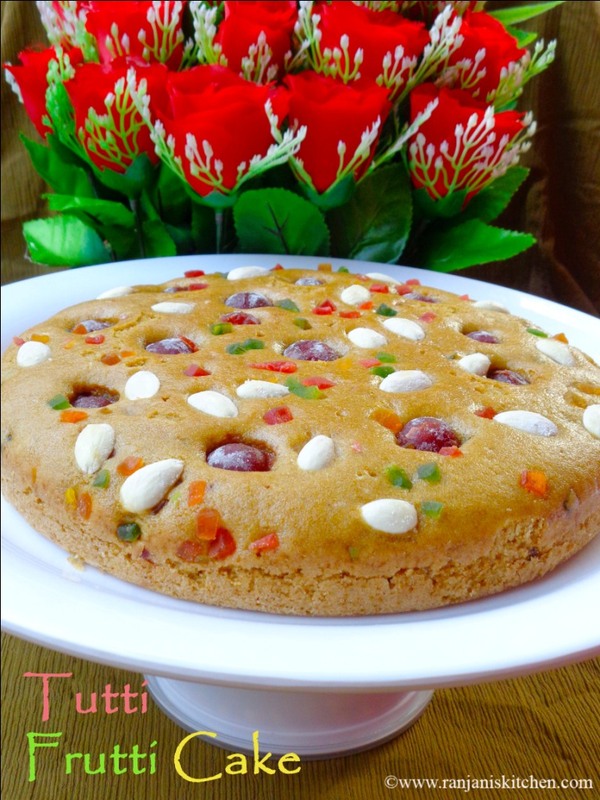 Arrange the tutti frutti, almonds and cherries on top of the batter. Place the lower rack in oven.Gently tap on sides of pan and immediately place it in preheated oven . Bake at 180 degrees for 35 to 40 mins. After 35 mins, check with a toothpick or knife, if it comes out clean, remove the pan from oven and cool down for 15 mins. Run the knife on the sides of the cake and invert the cake , place it in wire rack. Cool the cake completely and cut to serve as slices. I used home made wheat flour, but we can use store brands also. Hope that will be more tasty than home made flour. Add more tutti frutti’s if you need. But adjust the sugar accordingly as the addition of tutti frutti adds more sweetness to the cake. Do not over mix the batter as it will make the cake harder. Just fold and immediately place the pan in oven. Bake till the toothpick comes out clean. No need to over bake the cake. Preheating is important to get the perfect baking. So pre-heat for 10 mins at 180 degrees.